The Armenian scientists of old, during the time of Carahunge, could accurately measure latitude; knew that the Earth was ball-shaped; that its radius was equal to 6300km; had an accurate calendar, etc). These scientists also planned and were involved in the implementation of other well known ancient Monuments, such as the Great Pyramid in Egypt (3000 years “younger” than Carahunge); Stonehenge in England (3500 years “younger”); and others. Many of these Monuments retain until now, a link with the original Armenian name, e.g. Stonehenge, which has the same connotation as Carahunge, because “stone” in Armenian is “kar” and “henge” (a word which is absent in English) is the same “hunge” (voice, sound, echo in Armenian).Another example is Callanish in Scotland (Luis island in North Gebrids), because “kal” = “car”, “nish” in Armenian is “sign” and Luis is “light”. The same principle applies to the name given to the standing Stones in Carnac in Brittany (France), in Egypt, etc.Finally, it must be very interesting to our readers that many of the world’s well known ancient Monuments were built in definite and equal latitudinal distances from Karahunge. For example, the latitude difference between Karahunge and Stonehenge is about +10°; Karahunge and the Great Pyramid is about –10°; between Carahunge,Kallanish and the oldest Egyptian observatory and Temple of the Principal God RA (AR), near present Assuan, is ±16°.Armenian scientists of old knew mathematics, geometry, written language, astronomy, philosophy, etc. There were laws and order in existence, and Armenia was a Kingdom with dynasties. Carahunge confirms that Armenia was the first civilization on Earth, propagated knowledge and kindness everywhere and was the cradle of Indo-Europeans and Indo- European languages. Carahunge is 3, 500 years older than England’s Stonehenge and 3, 000 years older than the Egyptian pyramids. The total area of the observatory is 7 hectares. According to the scientist’s findings, a temple consisting of 40 stones built in honor of the Armenians’ main God, Ari, meaning the Sun, is situated in the central part of Carahunge. Besides the temple, it had a large and developed observatory, and also a university that makes up the temple’s wings. Edited by HyeFedayis, 17 June 2007 - 01:51 PM. Kelsey in Scottish Gaelic means Island. the Armenian word for Island is կղզի, kghsi, or, in ancient transliteration, Kelsey. Hen in Briton, Cornish, Scottish and Irish Gaelic means ancient, old, archaic. In Armenian the word is հին or Hin. There are many such parallels/cognates, indicating that Armenians did at least travel to these lands and exert considerable influence. Ara is the Irish moon goddess, which is interesting. "And" stop creating multiple threads. The information is different there are several names for this a mistake by me. Edited by HyeFedayis, 18 June 2007 - 08:59 PM. It's much more visible that way. ...indicating that Armenians did at least travel to these lands and exert considerable influence. Sure, in some alternative universe. Not really. It might mean that the two peoples shared a common Indo-European language while they were ONE and the SAME people in the part of Europe they were living. Over thousands of years, those people migrated to distant lands: some to Ireland, some to what is known today as the Armenian Highland. Your confidence on the matter far surpasses that of the entire field of linguistics and all of its most avid students. There are many migration theories, each of them having their own set of scholars and institutions endorsing them. Some, such as the discredited Thrace migration theory, is still entrenched in the American ("western") Armenology circles. The Armenia origins theory is taking steps forward in the international arena more as time passes. The Hittite punch was simply too hard a punch for the Herodotan theory. Hittites were concluded to be Armenian speakers by the first (and still the most highly credited) Hittitologist, and those very Hittites were an older presence than Herodotus' Phrygians. The assumption above is based on the Europe origin theory, which is one of the entrenched ones, but one that is less accepted as years pass. The Ukrainian/South Ural origin theory is more believable, but this too is getting slowly discredited. The most academically sound one is the Armenia origin theory due to the simple fact that the oldest known and deciphered Indo-European family languages have been found in the regions in and surrounding the Armenian Plateau. This is the conclusion that filled a 1500 page study by V. Ivanon and T. Gamkrelidze cited below, among other studies in multiple fields. There are a few non-Armenian sources that talk about the Armenia origin theory, which is supported by multiple principles. The most important of these is the newly emerging science of genetic migration which is making some important strides. As to the actual relationships between the languages, the oldest series of articles (not hindered by academic politics or political influences) that challenges the orthodox perceptions between these languages is written by Nikolai Marr, a very competent linguist of Georgian nationality who was very close with Hrachya Ajarian and was knowledgeable of the languages of the region. The most comprehensible and palatable critique that I have read (since Marr's "Japhetian" theory and its text are extremely technical in nature) was an Armenian linguist named Nigoghos Boyadjian who published his very good essay (I forgot the title, but I have a copy here somewhere) which he published in the Armenian Quarterly, a prestigious academic publication that was edited by Richard Hovanissian at the time (in the 1960s). In short, Mr. Boyadjian questions the very idea of there being a family to which Armenian is a full member. The main objection is the minority of root words that have been found to be common in the main stock of IE roots and Armenian. Only 10% or less of Armenian roots are in the IE grouping. He didn't draw any further conclusions, but he did make the following remark: Armenians are inheritors of a nostratic language, with single letter word roots in the common verbs, which to him was indicator of Armenian as being a very ancient language, in many ways predating the IE family. None of the older roots have any parallels in other languages except in developed form. he verb "to go" for example is one he mentions as one that is a single sound in Armenia as the root, the sound 'g' is the verb root. The closest parallel is the English verb 'go.' This was echoed by Jahukian years later, and Marr had hinted at this as well. The history of Celtic migration is much newer than the fall of the Hittites and the earliest known Armenian reference in the region. Martiros Gavoukjian's thoughts were that the Celts were of the same language family. He dwelled on the commonalities and assumed common ethnic roots, but the above scholars did not see the commonalities to be absolute evidence of common ethnicity, but they accepted that it could rather be influence. That's belief as well so far. In essence, I started believing the line about Herodotus' migration, then went tot he Ukrainian origins theory, and then found that the Hittites were older than all the supposed Armenian precursor cultures. then I found the works of Peter Jensen, and this blew the entire thing into a different stage altogether. I'm still looking, but my conclusion so far is that they were probably not entirely the same ethnicities, the Armenians, Celts, Latins, Etruscans, Greeks, and so on, but rather cultures that interacted closely with the Indo-European speakers. Interestingly enough, Greek and Phrygian are considered to be the closest relatives, but there are far too many differences to consider them automatically as ethnic cousins. In any case, the thread deals with the Stonehenges and Karahunj, and their relationships. My belief is that there had always been a contingent of Armenians (believe it what you wish as to what they were ethnically, but they were from Armenia) migrating to other lands, taking with them to those other lands and indigenous peoples their culture and knowledge, part of their language, and so on, the degree of influence depending on the political relationships and perhaps even demographic ratio/relationship. There is also the possibility that they are not related to each other at all, or perhaps their common ancestors predated any of the known ethnic divisions. - Merrit Ruhlen, The Origin of Language: Tracing the Evolution of the Mother Tongue (Toronto: John Wiley & Sons, Inc., 1994), pp 186-188. - There is also a very interesting article by Anchor Bble author Ephraim Spazier that talks about the possibility of the Armenain Plateau and the Nothern Zagros as a possible source of the indo-european language family in BAR (Biblical Archeologial Review). - Peter Jensen - Hittiter und Armenier (Strasburg 1898). Edited by hagopn, 23 June 2007 - 03:23 AM. Was it someone like Shahan who does not know the difference between Ջ and Չ Ջուր and Չուր/Չոր, ՀունՋ- ՀունՉ? Does anyone know the Armenian Language? The difference between հունՉhounCH as in hnchel and հունՋhounJ as in (stone) henge ? If we don’t know our own language how do we expect the others to know it? PS. Sad to say that I cannot understand one word of what the TV commentator is saying as she speaks as if the someone is holding a gun to her head to hurry up, and the expert speaks through his (big Armenian)nose. Don't get me wrong, I can understand spoken Armenian whether it comes from Abaran or zulustan. In the least the English speaking commentator enunciates and speaks audibly. Edited by Arpa, 18 February 2012 - 04:44 PM. The Drombeg stone circle in Ireland is very similar to Karahunj. In Scotland there are even more of them with striking similarity to Karahunj. The ancient Armenian observatory, originally known as qarahunge or qarapunge (stonehenge or stone bunch), dates its history back to 14,000 years, according to Vachagan Vahradyan, a mathematician and a PhD candidate in biological sciences. Speaking to reporters on Monday, the scientist said that though scholarly circles are not unanimous on the site’s origins, his own studies have found that it was really used for astrological research. He said that identifying the construction’s precise name is very important in terms of revealing the scientific truth and later protecting the site from political speculations. 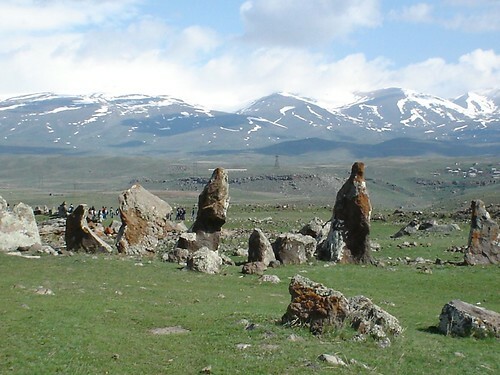 The scientist further referred to 13th century Armenian historian Stepanos Orbelyan’s records about the village Qarahunge, noting that the place received its name from a stonehenge. As for the construction’s purpose, Vahradyan said that despite archaeologists’ persistent efforts to prove that it served as a mausoleum site (with the holes on the stones having been used for tying horses or lifting stones), scientific studies have found that it was an observatory. “Archaeologist Onik Khnkikyan conducted studies in 1983 and advanced the hypothesis that the holes were observation posts used for watching stars. Elma Parsamyan later showed the stones through which it is possible to determine the parts of world. I have found, through studies, that the construction’s architecture and stonework reflect the Cygnus constellation. That also testifies to its astrological significance,” he said. The mathematician said that he has himself recently found one of the four stonehenges on the territory of Armenia. He said it is in the Lori region but did not name a specific location. “I think another one has to be in Nagorno-Karabakh’s Qarahunge village. After finding money next year, I have to try to organize an expedition to find the stonehenge,” he said.